Even though malaria deaths are down a very encouraging 25%, it remains one of the most devastating diseases in the world. Now we might have an unexpected new tool to fight against the spread of malaria: our natural smelliness. Since mosquitoes are the main carriers of malaria to humans, anything that can stop mosquitoes from coming in contact with humans is a very good thing. These insects are attracted to humans by our body odor. Our sweat, however, has no natural odor, and so it's actually the microbes that live on our skin that determine each person's specific body odor. The question then is whether mosquitoes are attracted to certain body odors more than others, and what role different types of bacteria play in this attraction. Niels Verhulst and his team at Wageningen University in the Netherlands examined the Anopheles gambiae sensu stricto mosquito, which is one of the main carrier species for malaria. They discovered that mosquitoes were most attracted to humans who had a high abundance but low species diversity of bacteria on the skin. Basically, people with a lot of the same bacteria on their skin were most attractive to these mosquitoes. The researchers believe that humans with a more diverse array of microbes on their skin are more likely to possess certain species that emit compounds, which in turn neutralize the aspects of human body odor that mosquitoes find attractive. This means mosquitoes are less likely to come into contact with these humans, and thus they are less likely to contract malaria. 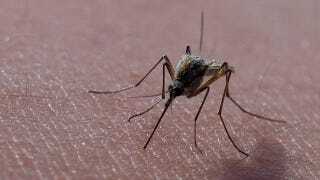 Of course, it's hardly a foolproof method for keeping malaria in check, but new treatments that can bring out these natural mosquito-repelling chemicals on our skin could play a vital role in disease prevention. Via PLoS ONE. Image by Calgary Reviews.